What did you like about the book? This is the eighth installment in the hilarious Johnny Boo series. It’s a perfectly silly early chapter book graphic novel for kids new to reading on their own. In keeping with earlier silliness, Johnny Boo invents something, but he’s not sure what it does. 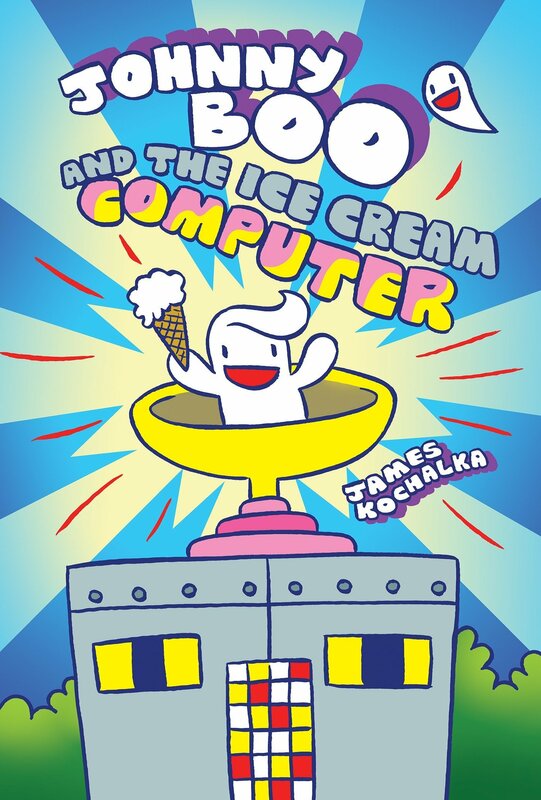 His rascally friend Squiggle helps him figure out that the machine makes ice cream, and then of course mischief happens. Bright vibrant colors, slapstick action, and Johnny Boo’s general lack of discernment make this totally funny and appealing. To whom would you recommend this book? Kids moving on from Elephant and Piggie will enjoy these readers. Should we (librarians/readers) put this on the top of our “to read” piles? Yes, if you’re a fan of Kochalka. This entry was posted in *Starred Review, Beginning Reader, Book Review, Comic / Cartoon, Easy Reader, Graphic novel and tagged Top Shelf Productions. Bookmark the permalink.